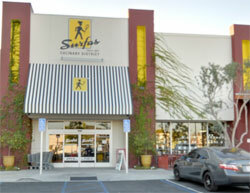 Surfas Culinary District is a Los Angeles, California based kitchen and restaurant supply store. 2 locations are Los Angeles (CA) and Hot Springs (AR). Find Warehouse, office and outlet store address of Surfas Culinary District. Surfas is a popular source for quality cookware or restaurant equipment for both the professional and serious food lovers. For over sixty years, Surfas has been designing and installing premier commercial kitchens. Surfas Culinary District is the online one-stop source for Surfas info (LA, OC, AR), events, and a selection of quality tools, food and equipment for all chefs. Storage, Supplies, Table Top and more.